Rose Namajunas is gunning for gold. The former “Ultimate Fighter” winner brought an end to the hype surrounding Michelle Waterson on Saturday night with a second-round submission before calling for a title shot in her next fight. 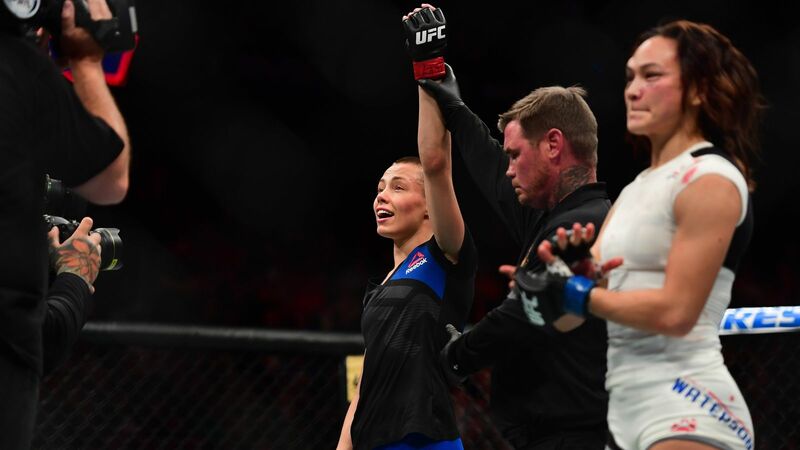 While Namajunas was the favorite going into the fight, Waterson enjoyed the lion’s share of the attention after her first-round submission over Paige VanZant last December. Namajunas clearly just sat back and prepared for the battle ahead. Waterson did manage the first offense of the opening round with a head and arm takedown, but the position didn’t last for long until Namajunas had worked her way around to take the back before eventually taking control on top. Once Namajunas had Waterson trapped underneath her, she started to unload punches and several hard elbows that cracked the former Invicta FC champion several times. As the second round got underway, Namajunas started to showcase her striking while avoiding Waterson’s kicks on the feet before unleashing one of her own. Just after a break from the clinch, Namajunas launched a kick that absolutely blasted Waterson in the face before she dropped to the mat. Miraculously, Waterson survived and actually worked back up from the ground, but Namajunas was quick to latch onto her back while searching for the rear naked choke. 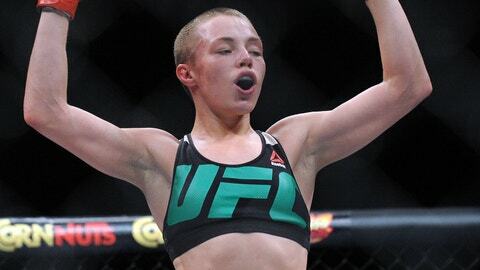 The fighters fell back to the ground as Namajunas locked up the submission and with her face turning red from the pressure along with blood dribbling from the nose, Waterson had no choice but to tap out or go to sleep. Following the statement win, Namajunas quickly called for the next title shot against the winner of the UFC 211 co-main event between Joanna Jedrzejczyk and Jessica Andrade.